You can change how your model diagram looks by moving elements or using Auto Layout, setting zoom levels, formatting labels and text, and reshaping connector lines or changing connector line routing properties. Changing your model diagram appearance can make your model easier to read and understand. The elements in a model can be arranged manually by moving the elements to the desired location. When you save the model, the location of elements will be saved. To apply an automatic layout to your model, click the ModelBuilder tab, in the View group, click Auto Layout Alternatively, you can right-click anywhere in the model and select Auto Layout Diagram. To automatically arrange only the elements inside a model group, right-click the group and select Auto Layout Group. Elements outside the group will not be affected. Select one or more elements or labels in the model diagram. On the ModelBuilder tab, in the View group, click Lock Element . To unlock the selected elements, click the Unlock Element button. Scroll the mouse wheel to zoom in to or out from the cursor position. Adjust the zoom slider control at the bottom of the model view. On the ModelBuilder tab, in the View group, click the Zoom in or Zoom out buttons. You can move between previous and next zoom levels and model diagram extents using the Previous Extent and Next Extent buttons on the ModelBuilder tab in the View group. To change the zoom level of your model so that all model elements are visible within the current extent of the view, click the Fit To Window button at the bottom of the model view or on the ModelBuilder tab in the View group..
By default, all elements in the model have the same font type, size, and color: Arial size 12, black. Use the Text controls that are under ModelBuilder on the Diagram tab, in the Text group to select a font, size, color, bold, underline, italic, and text justification to apply to the text for the selected elements. Ensure no model elements are selected. Use the Text controls that are under ModelBuilder on the Diagram tab, in the Text group to select a font, size, color, bold, underline, italic, and text justification. The connector lines between elements can be manually reshaped by clicking the connector line and dragging to the desired place. This creates a vertex on the line that can be moved so the connector line follows a custom path. You can reset all links in the model using the specified link routing method by right-clicking anywhere in the model and clicking Route All Links. To reset only the links inside a model group, right-click the group and click Route Group Links. Links between elements outside the group will not be affected. The distance between tools, variables, connectors and groups. For elements in a group, this property can be applied by right-clicking the group and selecting Auto Layout. The distance between stacked tools, variables, and groups in the same graph. The distance between unconnected graphs. The shape of the connector used while drawing or after using the Auto Layout command. Bezier—The connector segments will be Bézier curves. Cascading—The connector segments will be horizontal and vertical lines, each one orthogonal to its adjacent segments. Polyline—The connector segments will be straight lines. Spline—The connector segments will be curves forming an interpolating spline that passes through all control points. When checked, the layout attempts to force all links to point the same direction. If the arranged graph contains cycles, some of the links will continue to point the other direction. This property is checked on by default. When checked, the layout strives to straighten links that cross more than one layer of the graph. Because of the additional horizontal alignment constraints, the arranged graph usually occupies a larger area than when this property is unchecked. This property is checked on by default. The connectors will follow orthogonal routes. This property is checked off by default. Determines whether the model orientation should be changed from horizontal (unchecked) to vertical (checked). Determines if the model direction should be reversed. Determines the reading pattern of the model. Use this property if you want your model to be specific to left-to-right or right-to-left languages. Unchecked—The model's flow and text direction will be set to a left-to-right reading pattern. This is the default. Checked—The model's flow and text direction will be set to a right-to-left reading pattern. The layout of independent graphs in a model. This does not affect the elements inside a group. The layout of independent graphs in a group in a model. Determines whether the model will use a grid router to arrange model elements. Model drawing and interaction performance may be impacted depending on the number of elements in the model. Unchecked—Use a quick router instead of the grid router. This is the default. Determines whether the model will display a reference grid of points. The size of the routing grid. A smaller grid size will generate better results but may slow layout performance depending on the number of elements in the model. The additional cost to add to long connectors. Routing aims to find paths that have a minimal cost, so assigning a larger value results in the model using shorter paths. The additional cost to add to turns along connectors. 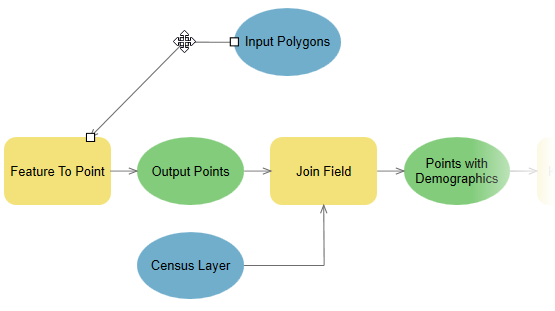 Routing aims to find paths that have a minimal cost, so assigning a larger value results in the model using connectors with fewer turns. The additional cost to add when connectors cross each other. Routing aims to find paths that have a minimal cost, so assigning a larger value results in the model using connectors that cross less frequently. The additional cost to add when connectors pass very near other elements. Routing aims to find paths that have a minimal cost, so assigning a larger value results in the model using connectors that do not pass near other elements. The size of the area around other elements in which passing connectors incur an additional cost is set using the Node Vicinity Size. The size of the area around other elements in which passing connectors incur an additional cost.